How does our understanding of a novel shift over time? Somewhat yellowing with age and with that musty smell of old paperbacks. I first read Graham Swift’s Waterland as a university fresher. 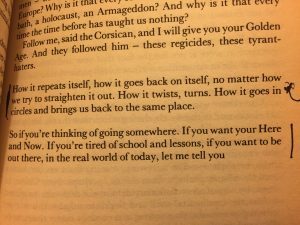 Twenty-five years later, I’ve recently re-read the novel as I prepare to teach it to a group of A level students. Reading the novel afresh has been an interesting exercise in how we read and how our understandings can shift or remain constant. As a novelist, Swift is interested the ways in which history repeats itself, the false promises offered of ever establishing reasons for events and yet their tragic inevitability. For Swift, there is no one narrative, no grand story which seems to sweep it all up, even if in strange ways history is both inevitable and inescapable. To explain the opening events of the novel – a body is mysteriously found one morning at a sluice – how far do we need to go back? Can we, perhaps like Dickens in Great Expectations (a quotation from which prefaces the novel), go back to childhood and the defining events of adolescence? Or do we need to go back over the generations in which the sins of our forebears are still felt today? And what about natural history? How does the land and its climate, the wildlife and economy shape events? Which history are we to follow? Coming to the novel again, I was struck by the complexity of my own history of reading the novel. My A level History teacher had enthused wildly about it and devoted at least one lesson to discussing it. I liked Mr B’s lessons. Sometimes irritating, argumentative, pompous and provocative, he was one of those teachers who actually taught pupils to think rather than pass exams, and doubtless my own experiences of A level History were at work as I started to read the novel back in 1991. Reading Waterland made sense of Mr B’s lessons, which were (to say the least) somewhat unconventional. While there was a syllabus to cover, getting through the A level course seemed to happen in our own time, especially in the endless notes on the sixteenth and seventeenth century Europe that I laboriously wrote. But Mr B’s lessons were quite different: endless discussions, usually on the nature of history or whatever was dominating the news. This was 1990 going into 1991. The Berlin Wall was falling and Thatcher too. Just as in the 1980s, when the final events of Waterland are set, history seemed to be coming to an end – or at least as we knew it. I came to realise (or assume, Swift might suggest) that Mr B identified with the central character of Tom Crick, an ageing History teacher whose own life seemed to be breaking up. Mr B was by no means a bad teacher, though he was often late or stressed, and he was in his final year, abandoning teaching early to run a guest house in France with his French wife, the fearsome Head of French. As for the novel, I was struck by its sense of atmosphere. I had read somewhere – probably the ‘Books’ pages of a broadsheet newspaper – that the finest writing, those works of literature which endure, has an strong sense of place, viz. the Bronte sisters, Dickens, Hardy, Stevenson et al. And Waterland certainly has that sense of place, of fenland marshes, rivers, dampness, floods and wartime East Anglia. And the novel’s explorations of the ways in which history repeats itself also chimed with me. Is history a great linear narrative? Will it reach a climax? If it does not turn in circles, what about spirals, with some end in sight? I don’t recall by any means all of the other novels I read in that first term of university for contemporary literature. Golding’s Rites of Passage was there, as was Buchi Emachata’s compelling (and now little known) Second Class Citizen and James Kelman’s The Bus Conductor Hines. But Waterland stuck with me. Perhaps it was the lecture given by my first year tutor, David Shuttleton, in which he wore green trousers, brown shoes and a blue shirt to tie in with the symbolism of the novel. Perhaps not. Maybe there was something in the writing. A few years ago, when attending exam board training, I filled in a questionnaire in which teachers were asked to suggest novels, plays or poetry which could be on a new syllabus. I nominated Waterland. I hadn’t read it again, but if it had struck me so powerfully, maybe it was worth a shot with the current crop of A level English Literature students. Someone somewhere else must have thought likewise. It’s there. I have, however, to confess that I have reached that stage in life when details of the books I’ve read seem to be vanishing, though hope that I am not turning into Tom Crick… Often I have an impression on the novel or play, perhaps even some quite developed critical perspectives, but no ideas about anything so trivial as the plot or characters. To teach Waterland was going to mean reading it again and perhaps even starting afresh in my understanding of the novel. And perhaps a lot of other reading: it shares much with George Elliot’s The Mill on the Floss, a novel I adored at university, but which I’ve never tackled since, and about which – Maggie and Tom, debts and floods aside – most details are horrifically sketchy. Fortunately, I still had my original copy of Waterland and it’s the one that I intend to use when teaching. The physicality of books – that experience of turning pages, of being able to leap to particular sections and easily compare passages – is an advantage that paper holds over e-readers. And they allow, too, for easy annotation. Although I wrote an essay on the novel as an undergraduate, finding it amongst the detritus of my loft is a step too far. But my marginalia in my copy of the novel suggests that I was able to find the ‘pertinent’ parts of the novel quickly, those moments when narrative voice almost gives way to authorial perspective. But amongst my annotations there was much missing. Perhaps the ideas had been in my head and I had simply failed to note them. I’ll never know. As I read, however, I was struck by my apparent naivety the first time I read the novel, particularly concerning its more challenging themes. Memories of much of the novel came back, but there was much I’d missed. Sections I found quite moderate as teenager I now find distasteful and lurid. Perhaps, though, I read now too much with a teacher hat on, aware of offence and the dangers of inappropriate material in the classroom. I found, too, some of the symbolism of the novel crass. But I found much I admired, paradoxically, in its use of symbol and motif. Waterland is a cleverer, wittier novel than I realised. I’m not sure I ever found the character of Crick comic – as a nineteen year old could I ever really identify with Crick’s older self even though with his younger self, the subject of the novel, I certainly did? Crick’s comments to Price, an awkward Sixth Form student, are both amusing and ridiculous. School stereotypes abound, and as a teacher I now read those quite differently. I loved, too, the different narrative voices of the novel. While told from Crick’s perspective, Swift ranges widely from murder-mystery to natural history. And Swift has a fine sense of style, the kind of prose which is often rich in allusion, sometimes self-referential but written not simply with a sense of post-modern knowingness: despite my greater understanding of the novel’s. Structurally, Swift’s talents are outstanding, echoing his theme of the nature of history. It’s well edited, too, coming in at less than three hundred pages, a tip some contemporary writers might usefully pick up. It’s interesting, however, to think how my own activities at present now shape my thoughts on the novel: recently, I’ve both taught and directed The Winter’s Tale and the fairy tale nature of the novel was something I’d never really picked up, nor the moments that echo Hansel and Gretal. Nonetheless, what struck me most in my recent reading is something which only the experience of reading more widely can bring. Twenty-five years ago, it was the first novel I’d studied which experimented with form. Swift abandons linear narrative in favour of a form in which interwoven strands of the story – sometimes extending over hundreds of years – finally reach their conclusions in the completing climax of the novel. But conclusions cannot be found easily, and the ‘why?’ which is asked is never really answered. In this, I see now that Swift is far from original in this, and that he is drawing on alternative ways of telling stories which can be traced back to the eighteenth century and certainly to Joyce’s Ulysses, and such experimentation with form is almost a defining characteristic of contemporary literary fiction. I also see now much more clearly the ways in which the novel echoes other literary fiction from the late twentieth century. Dark secrets, a quest for redemption never fulfilled, the inescapability of history, rumination on the nature of story and the the impossibility of truth – such ideas would not be out of place in Ian McEwan’s Atonement. Indeed, Swift’s novel, like much modern fiction, raises an interesting question. Why in our age which is so quick to proclaim its ‘advanced’ state are writers so interested in what are esstenially religious or existential questions? And as for the end of history, that question which the novel raises… Whether it’s 1982, 1991 or 2016, the mess that is human history never seems far away. Nuclear armageddon hasn’t quite gone away (or more accurately perhaps it’s returning (spirals, circles)) and new threats have arisen, from Trump and Brexit to Syria, Yemen and Putin in Russia. Yes, Swift’s novel certainly isn’t that dated. So reading changes over time. We might be well aware of how this happens as a reflection of broader changes in society (e.g. Feminist readings of texts) but even as a private reader our understanding shifts, changes focus, notices new ideas, picks up on different allusions, catches details previously glossed over. And as our breadth of reading increases, so does our ability to evaluate what we’re reading. But perhaps more than anything as our personal circumstances change, our experiences broaden and our outlook inevitably shifts, so does our ability to connect with a text. In less than twenty-five years time, like Crick, I’ll be retiring. Now.. I wonder how that will change how I read the novel!